An exhaust is a system that directs toxic gases from the engine to one or more exhaust pipes – away from the driver and passengers. It also reduces the emissions vehicles release into the environment, controls the noise and can improve the performance of the engine. So, even if your car runs smoothly, but it doesn’t sound pleasant, it’s most likely the case of a bad or failing exhaust. Solution: exhaust system replacement. The question of the hour is: aluminium or stainless steel exhaust system? There have been many debates over which one is better when in reality it’s all about personal preference, the model of the vehicle and driving environment. If you are living in the hottest areas of Australia where there is no rain at all, then an aluminium exhaust system would be the right choice for you. Apart from these exhausts coming at lower prices, they are a great match for the lack of humidity, snow and salted roads. 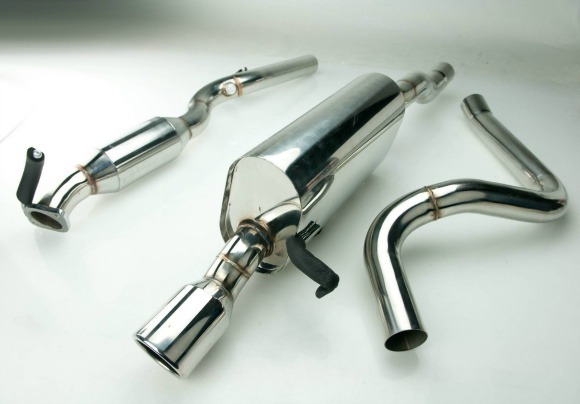 The real difference between aluminium and stainless steel exhaust systems is the manufacturing process. For instance, aluminium steel is made by taking a standard-grade steel, and through a hot-dip galvanising process an aluminium layer is added to the final products aluminium-silicon alloy. The density of the alloys is so strong that keeps out moisture and other elements from damaging the exhaust. Compared with the stainless steel one the aluminium exhaust is lighter, cost-effective and highly workable. The stainless steel exhaust system on the other hand, is covered with chromium, nickel and manganese as to create corrosion resistance alloy. There are many stainless steel grades, however, the 304 and 409 are the most commonly used ones for building exhausts. For instance, the 304 is built with at least 16% chromium content, so there won’t be any corrosion problems at the welding points. On the other hand, the 409 is built with more carbon and less chromium where they are more susceptible to corrosion, but more heat resistant and stronger. Both types are sturdier compared to aluminium exhausts, but that feature comes at a price. Each one has an advantage or two over the other in certain aspects, and the only thing left to do is to decide which type of system will be more suitable for you considering the reasons mentioned above. Another thing to add is your riding habits, which should be taken into consideration because they are also important as the weather when it comes to choosing an exhaust. The last thing to consider is the time you spend on the road exhausting your exhaust (chuckles). It should go without saying that a more frequently used vehicle in time will end up with slightly damaged exhaust system at the least.